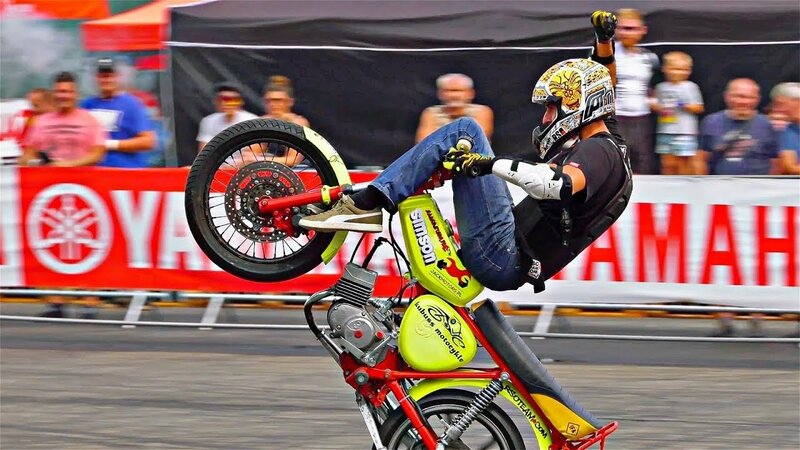 Top stunt rider Pawel Karbownik makes a stunt show on an old moped Simson at Czech Stunt Day in Ostrava. The bike has OEM rear sprocket and OEM engine, but Pawel easily makes wheelies, even highchair. For stoppie he has installed front brake rotor with caliper and added handbrake for tank wheelies. Check 50 stunt and learn how to wheelie low-power motorcycle. Pavel rides Simson moped S51, 50cc, 3.7hp.